Designed for my students, to find out where I am and what I am up to! The Geosciences Phase I Ideas Lab is expected to bring together multidisciplinary expertise representing all geoscience disciplines (including polar science), STEM education practice, cyber-learning, virtual organizations, diversity, and higher education administration, among others, to consider novel approaches to undergraduate geoscience education that develop essential competencies and skills for the workforce and increase access for diverse student populations. A major obstacle to preparing the future geoscience workforce is lack of access to relevant undergraduate courses, degree programs, and research opportunities at community colleges and minority-serving institutions. Such institutions have limited capacity to establish sustainable, stand-alone undergraduate programs in the geosciences, thereby limiting student awareness of career opportunities in, and pathways into, the geosciences. Smaller institutions often cannot offer students opportunities to experience sophisticated instrumentation or data used in the geosciences. As many of these institutions serve traditionally underrepresented students pursuing STEM careers, these limitations pose barriers to increasing diversity in the geosciences workforce. The small size of the academic geoscience workforce compounds the situation by making it difficult to scale-up important geoscience education activities, and especially field- and facilities-based experiences, in order to reach a larger student population. The rapidly evolving landscape of higher education offers new opportunities to develop innovative strategies for overcoming these obstacles. More widespread access to web-based content and coursework, as well as innovative pedagogical approaches, are improving access for students who might otherwise be excluded. Competency-based certificate programs that transcend the boundaries of “bricks and mortar” institutions illustrate some of the transformations underway that may foster development of highly customized, student-centered degree programs “without borders”. These changes raise important questions about how to ensure the quality of undergraduate education and integrate a panoply of experiences so that students leave with the necessary competencies and skills, whether as a member of the geoscience workforce or as a citizen confronting geoscience-relevant decisions. I was just asked a few weeks ago to serve as a mentor for the faculty selected to participate in this event. I was honored to be invited to serve in this role, and after some advance travel planning (involving my husband meeting me at the airport to switch luggage from the ScienceOnline conference last week so I could grab my luggage for this week), I headed off to the Ideas Lab. The Geoscience Ideas Lab was held in Lessburg, Virginia, at The National Conference Center. This building was where we worked, ate, and slept – seriously, we did not need to go outdoors for five days, especially since all of the buildings at this complex were connected by underground tunnels. It was the first time I had ever checked in for a conference and was given two maps just to be able to go find my room! These buildings were complex in their layout, with every hallway labeled with a street name, different wings of the buildings with different colored walls, etc. 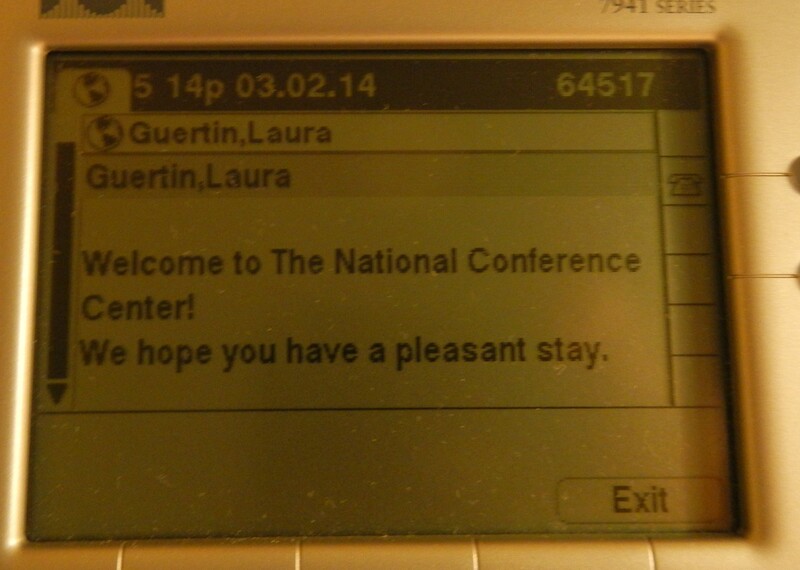 The room I was in was about the size of a dorm room, but with a private bath and a phone that was more complex than the phone I have in my office on campus – it even had a welcome message waiting for me on its screen! 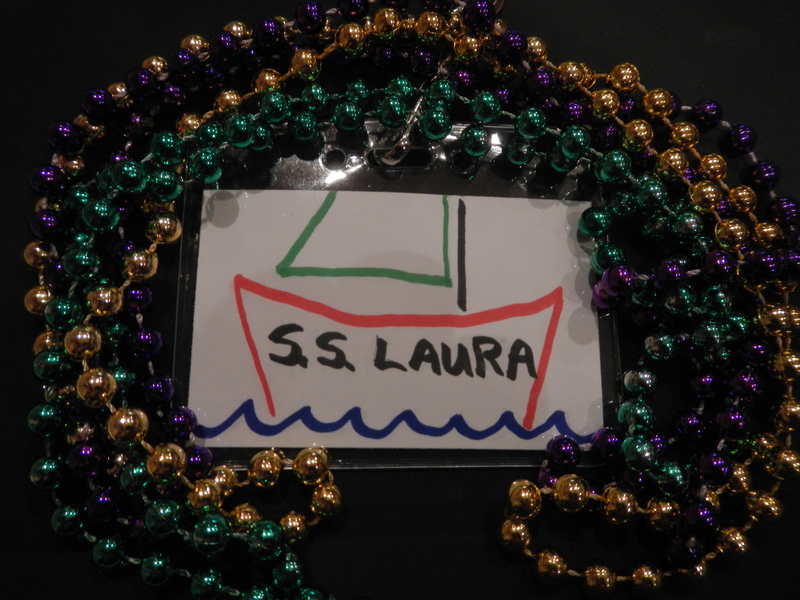 Each of us were asked to design our own “creative” name badge, so I made mine as a ship (to represent me as a marine geologist and my future participation in the NOAA Teacher at Sea program). As a mentor, I also wore Mardi Gras beads, just for fun! The Ideas Lab was facilitated by a group called Know Innovation, working from the model of a Sandpit. The week involved several guided activities and sessions to get the group to think outside of the box towards innovative models and different approaches for addressing the challenges listed in the Ideas Lab description I posted above. We watched TED videos, or what KI called “Stimulus Videos” about Khan Academy, Goldieblox, and talks by David Blaine and Sir Ken Robinson. We used lots of Post-It notes, all different sizes and colors. The black Sharpie was the writing utensil of the week. M&M’s provided the much-needed boost of energy in the morning and afternoon sessions. And every day, we entertained ourselves with stories of getting lost in the NCC building complex. I would typically give credit to the artist, but in this case, I think he is fine not having his talent of drawing in a brown paper bag credited! I won’t share any of the “ideas” that were generated or discussed during the week – those ideas belong to the participants that were in the Sandpit. But the techniques we used are certainly ones worth some mentioning. 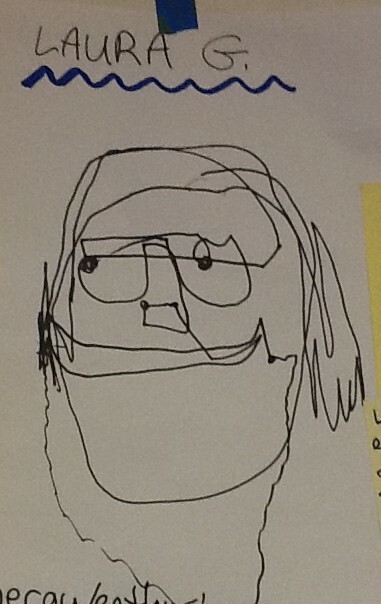 I look forward to exploring more about how to brainstorm to the third third, providing feedback as a positive/potential/concern (with the “concern” always phrased as a question starting with “how can you…”), and the Picasso in a Paper Bag drawing exercise (see the image to the left (yes, that is supposed to be me) that was drawn by one of the workshop attendees). We also did several rounds of “speed dating” to break the ice and get to know one another, which actually was incredibly productive. Even though my role this past week was as a mentor, there is much I learned that I can take back and incorporate in to my own approaches with my classes and campus committee work. So for my students – I apologize that I could not blog every day and share with you what was going on at this meeting. But rest assured, there are lots of geoscience faculty and faculty and informal science educators in other disciplines that are working towards great ideas in geoscience education, from serving the individual student to full geoscience programs. Inspired by @washedashoreproject @art_to_save_the_sea , I asked my oceanography students to save their plastic bottle caps all semester. Today, we created objects to spread awareness of plastic pollution and impacts in the ocean. We’ll be sharing these during an outreach program with 7th graders. We welcomed a group of 7th grade girls from Northley Middle School to campus for an exploration of the intersections of art with oceanography, math, biology, and engineering. They even got to do some 3D printing! Excited to assist with a geology field trip today at @TylerArboretum - but difficult to get everyone to focus on streams and soil with the snakes out in the sun!